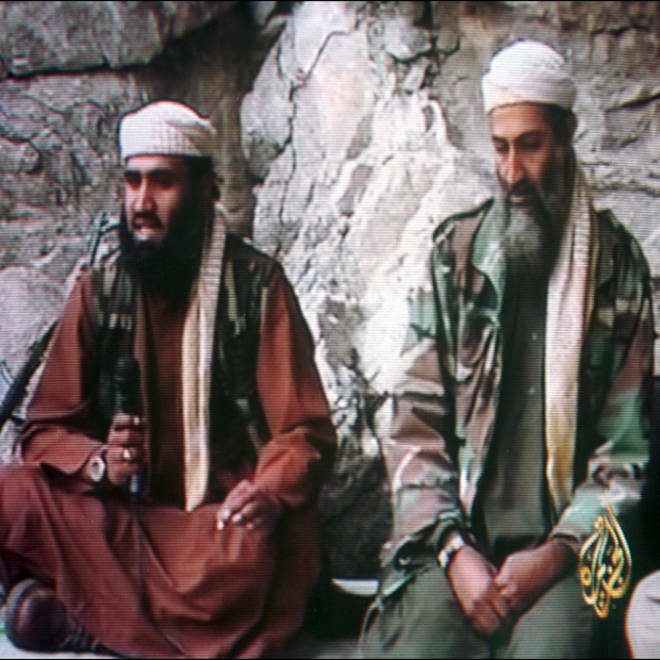 Sulaiman Abu Ghaith, left, is seen with Osama bin Laden in a video image released by Al Jazeera in 2001. U.S. officials say Sulaiman Abu Ghaith, captured last month in Turkey and now in New York, has spent most of the last decade in Iran, in some sort of confinement. Back in late 2001, as U.S. troops and Afghan tribal forces were dismantling the Taliban control of Afghanistan, Osama bin Laden made a decision. He sent his operators, people like Khalid Sheikh Mohammed, Ramzi bin al-Shibh and Abu Zubaydah to the cities of Pakistan where they were to hide out and plan further attacks against the US. All of the key players were captured or killed, with the exception of Ayman al-Zawahiri, al-Qaida's No. 2 who remains at large, having survived at least three Predator attacks. At the same time, bin Laden sent his top managers, al-Qaida's Management Council, to Iran, arming them with money to bribe their way across the border, according to multiple US and Iranian officials. Bin Laden apparently hoped that the Iranians would see the group not as Sunni terrorists but as "an enemy of my enemy," as one senior U.S. official put it. Among those who made their way into Iran were Saif al-Adel, al-Qaida’s military director; bin Laden's son Saad; and Abu Ghaith, the group's communications director ... and also bin Laden's son-in-law. At one point not long after its arrival, this group, numbering in the hundreds with family members and bodyguards, was captured by Iranian authorities. Although senior U.S. officials have told NBC News they did not know the conditions of their confinement — "it was the blackest of black boxes," one former senior U.S. official told NBC News — Iranian officials said the group was "in jail." One Iranian official, former U.N. ambassador Javad Zarif, told NBC News in the mid-2000s that "no nation has captured as many al-Qaida members as Iran." US officials admit that other than some mundane communications, they were unaware of any significant roles played by the group while in captivity. Officials tell NBC News he had been a prisoner in Iran for most of the past decade and is scheduled to appear in federal court Friday. NBC's Brian Williams reports. "Every once in a while, we would intercept non-operational communications from them to relatives back home. That was it," said a former high-ranking U.S. official. The U.S. didn't know where the group was held nor all of the members’ identities. On occasion, there would be reports that all or some had been released, but there was little confirmation. Many in U.S. intelligence believed Iran held onto them for use as bargaining chips and not just with the U.S. They were in effect hostages. If al-Qaida carried out attacks in Iran, as it had in the 1990s, the group could face harm. On occasion, flurries of intelligence would lead to further investigation, but again without any resolution. In 2009, Saad bin Laden was killed in a Predator attack in Pakistan, leading to speculation that others had been released. But again, U.S. officials could not determine how many, if any, had been let go. Moreover, it was not a high priority for the U.S. because the individuals were no longer considered much of a threat since they had been out of action for so long. Last month, Abu Ghaith was detained in Turkey then was being sent to Kuwait via Jordan. But he was intercepted in Jordan and brought to the U.S., according to U.S. officials. According to court documents, he has been charged with conspiracy to kill Americans, including actions related to the 9/11 attacks. Officials say that Abu Ghaith is unlikely to have any operational information because he has been in Iran for so long. Now, they admit his intelligence value may be more about his captivity in Iran and whether he was released or escaped. NBC News Justice Correspondent Pete Williams contributed to this report.